I receive so many calls and emails from owners of wild cats that should never have been bought as “pets” in the first place. Unfortunately, this month has been no different. 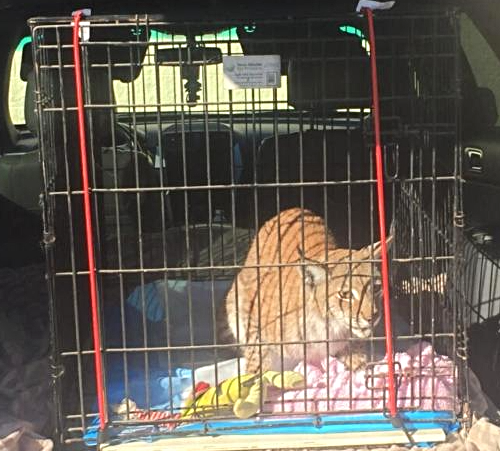 I’d spoken several times with an out-of-state owner who has a Eurasian Lynx. Named Aria, this lynx was doing what most do – becoming quite aggressive as she hit maturity. They’d declawed her hoping that would make her “safer,” but it didn’t. Sadly, the story’s so often the same. Her owners loved her dearly. They had no idea this would happen. They believed what the seller told them, that she could be a pet. Now, what could they do? I’m so thankful her owners put her needs first and placed her with us. Our trained rescue volunteers drove 32 hours to pick up Aria. She was a very calm traveler and is being curious and calm to our staff. She reminds us so much of those we’ve loved and lost this past year. She has the coloring of our Eurasian lynx Lindsey and the personality of Max, another Eurasian lynx of ours. She’s only 2 and a very tiny girl for a lynx. Aria will know nothing but compassion and love here, thanks to your support. As with all our new arrivals, she’ll have her intake exam and move to a quarantine habitat after that. Then, we’ll try play dates with others so she can have companionship with others. Since she’s so young, we look forward to her having a long, happy, wild at heart life here at The Wildcat Sanctuary. If you’d like to become her sponsor parent, that would be sooo helpful. You can do that HERE.